One month to the day after they were hatched out into this world, twenty four chicks lost their little lives to a marauding fox. Last night, as I was getting into bed, I had a bad feeling. This happens a lot to me, though, so I dismissed it as simple overworry. But for some reason, I found myself thinking about how protectiveness of my chicks had made me second guess my previous pro-wildlife-at-any-cost stance: specifically, I thought, Heck, I think I could actually bring myself to shoot a fox if it were going after the little ones. I never got the chance. This morning, twenty-four of my babies were dead or missing. A predator — presumably a fox — had dug underneath of the coop, deep enough to avoid the coop’s chicken wire skirt. Last night, Emmett and I tucked them into bed. We made sure they were all together to stay warm, moving the four chicks on the top floor onto the ground floor with the rest of their buddies. Where the chicks were huddled — underneath the ramp, in a warm all-wood section of the coop — was precisely where the fox dug. Our decision to move four chicks (including my favorite, Buffy) down to the bottom floor may have cost them their lives. Emmett’s dad was the bearer of the bad news; he couldn’t reach Emmett by phone, so he actually stopped by the house to tell us. Emmett and I raced over to the coop, combed the surrounding area, calling out “here, chick chick chick” through our tears, to no avail. We found one White Leghorn dead inside the coop; two others were left in a nearby salad bed, along with one wing of my favorite chick, Buffy the Buff Orpington. The predator didn’t even bother to eat them, just kill them. The sole survivor, now named Hope, was found huddling beneath the coop’s ramp. Nobody noticed her until I moved the ramp to check for more bodies — and to my surprise, heard a little “cheep cheep cheep” emanating from the coop’s first floor. We swabbed Hope’s wounds — bite marks — with Neosporin, and put a heat lamp over her to warm her little body. She’s now in a box with two other Araucanas for company; we’ll see if she makes it. She’s a bit wobbly and lethargic, but she drank water from the waterer, ate food from my hand, and snuggled against my neck the entire car ride home. 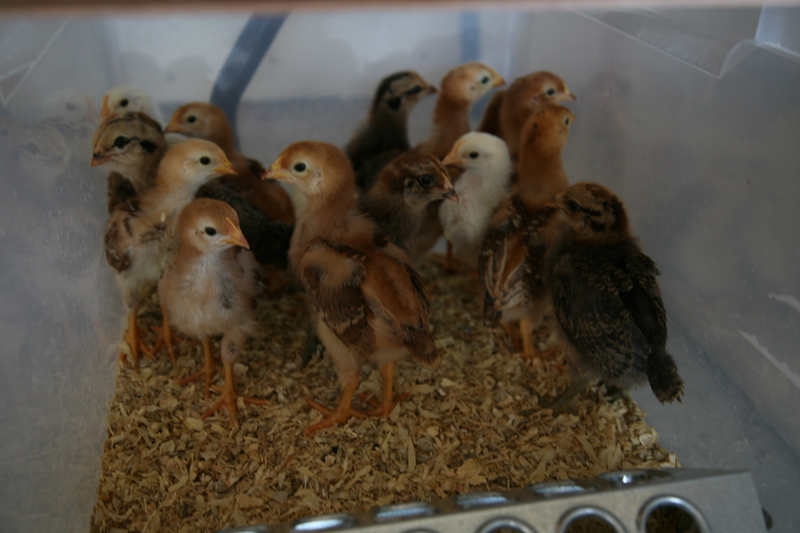 I can’t quite express the horror of losing 24 chicks that I’d doted on, lost sleep over, and — most importantly — grown to love and know, as bird-brained and silly as they might be. A number of the ones I lost had names and distinct personalities; all were very friendly, and would come right over to say hello when I stopped by the coop.